Caption slip reads: "Photographer: Gaze. Date: 1954-05-14. Reporter: Sandusky. Assignment: Venice Beach death. 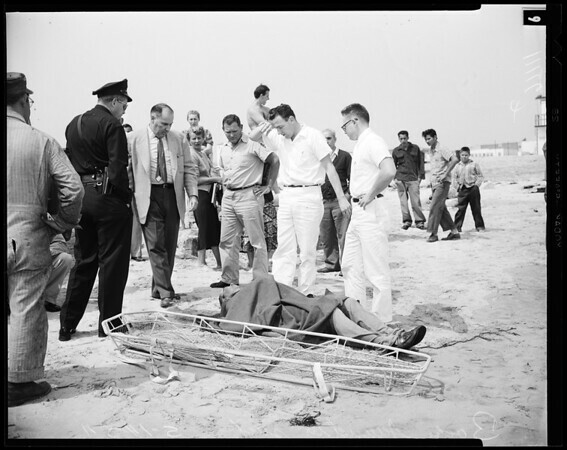 6-29: Investigators and others stand beside body of man (not yet identified) pulled from the surf behind the breakwater of the old Venice Pier by a passerby (Nathaniel Smith, visiting from Sacramento). Detective Stewart Jones said the man appeared to have been shot through the head. Suicide question -- or.....".